Handeni Gold Inc. Update On Exploration Program – The Mjembe Target. Vancouver, British Columbia, July 16, 2013 — Handeni Gold Inc. (the “Company” or “Handeni Gold”) (OTCQB: HNDI) is pleased to provide an update on the exploration activities conducted on its exploration licenses in the United Republic of Tanzania. An extensive soil sampling program and ground magnetic survey on the Mjembe target (Fig. 1) has been completed. Mjembe is located on PL6744/2010 and is a known artisanal mining site. The selected survey and sample area consisted of an approximately 23 km2 block. A total of 5068 soil samples have been analysed for a suite of major and trace elements by desk top Energy dispersive XRF. The aim of the exercise was to delineate narrower target areas, to define a usable element suite indicative of gold mineralization that would reduce the number of samples submitted for Au assays, to evaluate the correlation (if any) between various geophysical parameters and geochemistry and to define targets within the 23km2 block that may develop into drill targets. The results are highly encouraging. Fig. 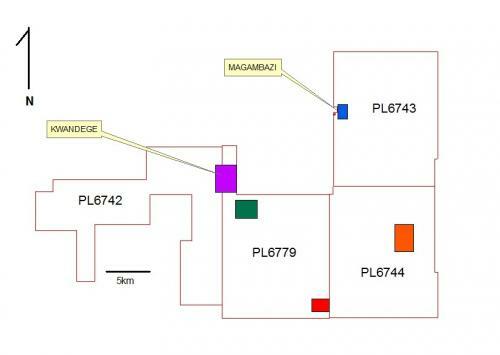 1: Location of the Mjembe target (Target 7) (Orange) in relation to the Magambazi East target (Blue), Kwandege Project (Purple), Target 5 (Red) and Target 6 (Green) on Handeni’s 4 prospecting licenses. An EM (electromagnetic) anomaly of approximately 5,5 km (NNE strike distance) is particularly well defined and corroborated by enriched Fe and a depletion in Sr as determined in soil samples. Anomalously enriched As, Cu, Co and Zn values also coincide with the geophysical anomaly (Fig. 2). The artisanal gold activity is on the north western fringe of the electromagnetic and geochemical anomaly. Ground magnetic data outlines a superimposed NW-SE structural trend seemingly coinciding with the geochemical anomalies and artisanal mining sites. 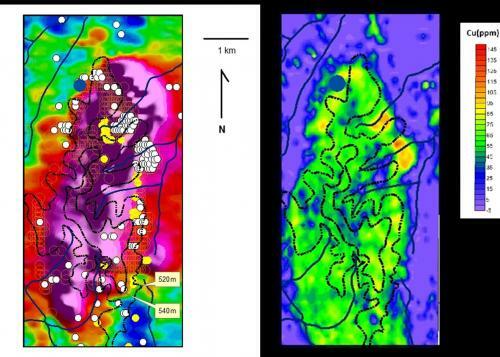 Preliminary interpretation suggest that the Mjembe anomalous area represents a target within a plunging sheeth fold on a scale of 10 km by 3.5 km. The geophysics indicates the continuation of this structure in depth to the east of the surface geochemical anomaly. Exploration on each of the anomalies within this structure will now focus on more detailed ground geophysics and mapping to be able to prepare drill targets within the larger Mjembe target area. Fig. 2: Geochemical data superimposed on geophysical data for the Mjembe anomaly. Background purple represents an intensive EM anomaly potentially caused by graphite/and or massive sulphides. The Mjembe artisanal workings are indicated as a blue dot (primary rock mining), As anomalies as yellow dots, Cu as white dots and Co as orange open circles (left hand diagram). River systems are blue lines and elevation contours (above mean sea level) are in black. The close association between Cu anomalies in soil and the EM data is illustrated in the right hand diagram. HNDI is also currently finalizing data interpretation on Target 6 (Fig. 1) which has been explored following the same procedures as for the Mjembe anomaly.